It is designed by the john-doe advertising agency (and not by a guy named John) and its operation is straightforward. You just press the number and talk. 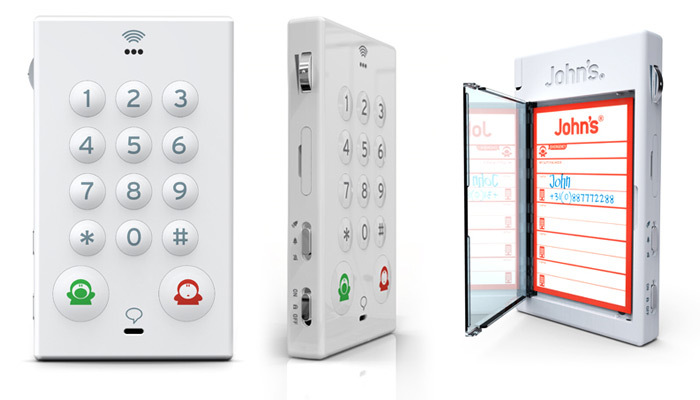 There is a speed dial function (with memory for 10 phone numbers, one for each button) and a very small monitor on top that may serve the most basic functions (pin number, battery info etc) but its few pixels can be customized. In the back there is a hinged case where paper cards with phone numbers and data can be stored. An integrated pen will also come handy. As the company says apart from a fashion statement it would be ideal for small children or elderly people and in general for anyone who doesn’t know or doesn’t bother to operate a complex mobile phone. John’s phone is not just a concept. Working prototypes are being tested and there is an e-shop that receives orders. It costs between 70 and 100 euro, depending the color and surface treatment, not bad for a simple but thoroughly designed gadget.